An intense formulation designed to repair and hydrate tired, dry hands. With a non-greasy finish, this cream is a definite favourite amongst golfers for softening even the toughest dry skin. Conditions and nourishes skin and cuticles; botanical extracts provide protection and combat bacteria. Fragrance-free. Colorant-free. Dermatologist tested. This is the best hand cream I've ever used. The great thing is it actually works. My hands feel much softer, healthier and dry areas have vanished. I also like the refreshing menthol type of smell when you apply the cream and the way it absorbs completely. I'll definitely be buying this again. This product really works very well, suffered for years with sore & cracked hands due to working at sea, after 3 weeks use I can honestly say my hands are 100% better. The only problem I have with the product is hiding from my wife and daughters they love it. Keeping this short, I can say that none of the many, many hand creams I have used over the year come close to the quality of this product. 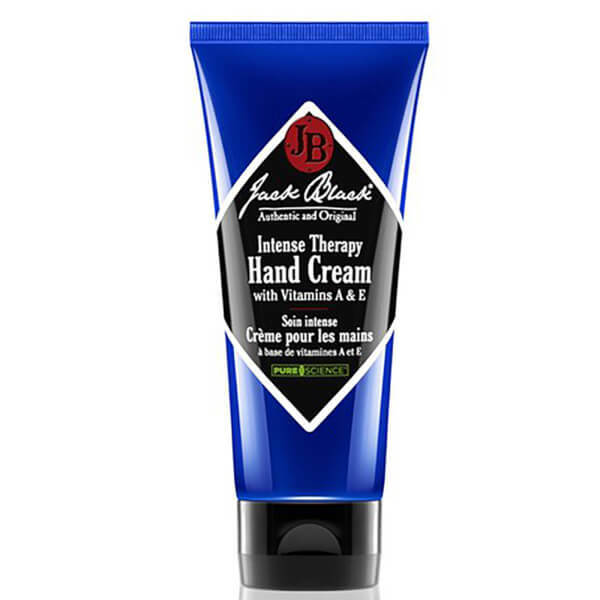 It is unrivaled as a hand cream! This is the first hand cream I have used and I am very impressed. I have been applying this every other day just before sleeping and it has left my hands feeling generally much better. They are no longer dry and I no longer have any cracking skin around finger nails. Like with all Jack Black products a little goes a very long way. Would definitely recommend this product. Jack Black Intense Therapy Hand Cream is an excellent hand cream. I have tried several different creams over the years, and this takes the gold star.